This work presents the wake of the death specially of a child, a “baquiné”; where you see people enjoying while parents weep and suffer the loss of their son. Oller through this work presents the social problems of the island, and the concept of death in our culture. “The Wake” is listed in impressionistic and realistic style. “The Wake” Oller, is considered an example of mastery in the art of combining colors. 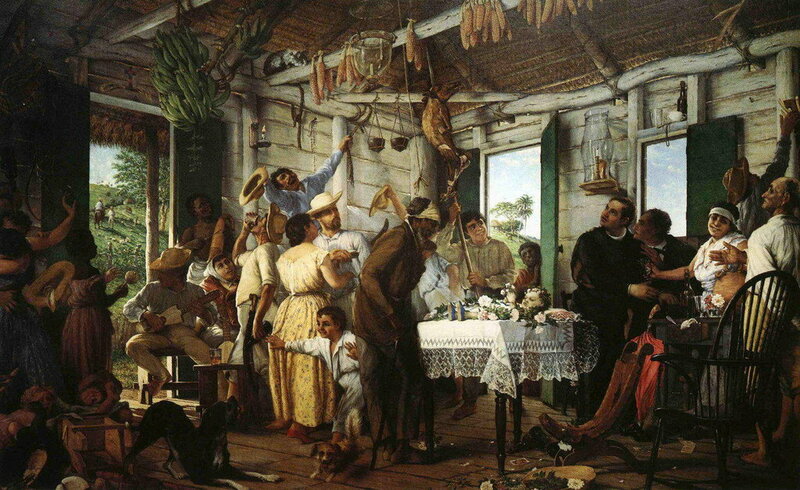 It is a study of different types of Puerto Ricans; in this case presented by the wake of child or baquiné, the celebration occurred mainly in the field. In the picture we see the child on a covered table flowers ignored by the participants, who are enjoying and celebrating. You can see parents suffering the loss. The mother, who has a turban think your child is now an angel that goes straight to heaven. We see a group of believers who become child’s death cause for celebration to dismiss the angel, party accompanied with prayers, songs, dancing, games, food and drinks. The reason for the meeting “sacred” is to please the little angel for this, as in heaven, they answer the favors are asking in your prayers. One can see in this picture the altar, in the center of the table, decorated with flowers where the child is a person observing the child, while others are consoling mother and celebrating baquiné. 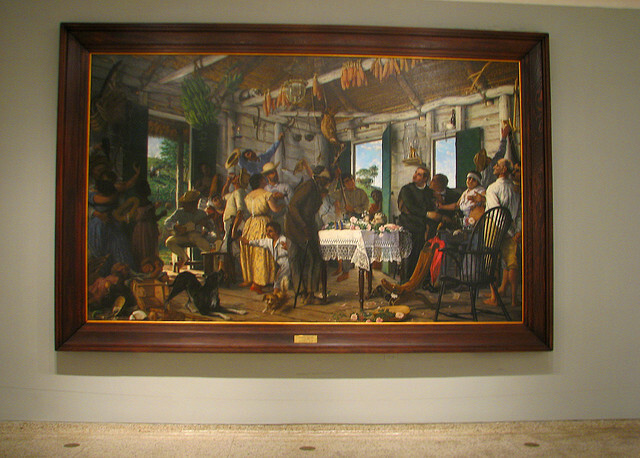 It shows the lifestyle of the Puerto Rican Jibaro for this century. Although a humble house, we see that the food is not necessary, nor animals. Different types of musical instruments like maracas, guiro, cuatro and a mandolin can also be seen. Oller painting portrays us as a society, exposing our ideas of death, faith and hope in prayer and miracles, and the belief that after death there is eternal life in paradise. Oller painting, provides a basis for analyzing the concept of death. We see in our culture are mixed religious and profane. We projected a clear and straight, one of our attitudes as a people, our solidarity with the pain and grief; how we perceive the concept of death and religion. Our beliefs and superstitions are also reflected in this painting; beliefs or superstitions that greater or lesser extent, still retain. “The Wake” portrays not only presents part of our culture, but also a piece of our historical and social development. 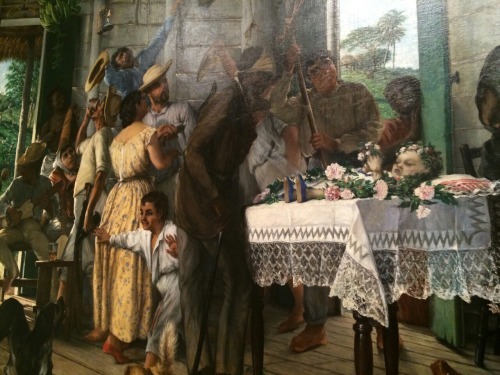 In short, beyond being one of the most important paintings of the Puerto Rican and international painting, is an invitation to analysis and reflection of us as a people. A town with a large and different from other culture and that makes us unique. I recently purchased this art work.Its colors and the people so much going on. had no idea of its meaning. But doing search history I was amazed. By the way I purchased it at a Goodwill store. Thanks for the sharing! Enjoy your new piece!!! I’m an English teacher in Puerto Rico and often combine art appreciation with communication activities. I use l Velorio for practice as so many things are happening at once. 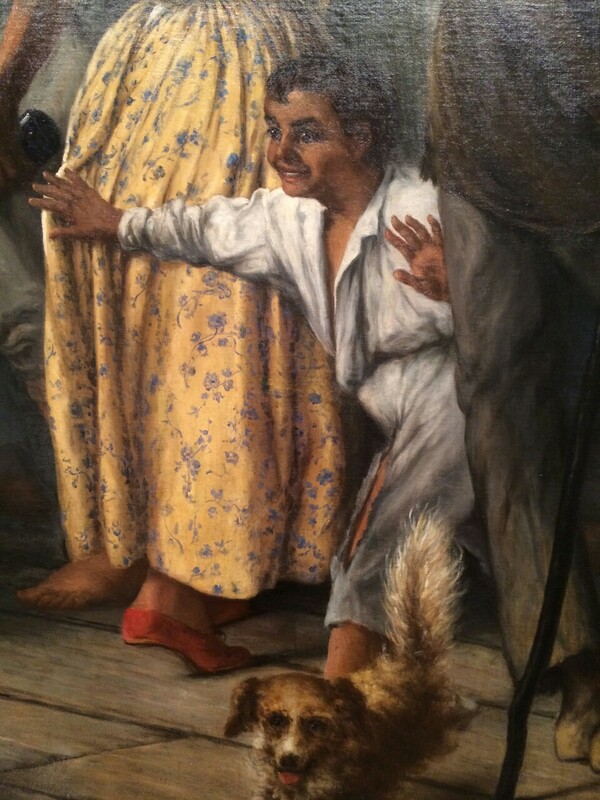 Can you suggest other paintings that have a scene where multiple people are doing different things. I congratulate you for your site.